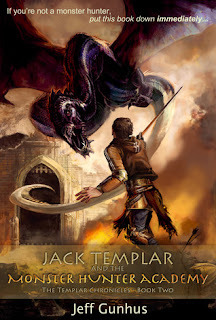 This is the second book in the Templar Chronicles, in which we watch Jack Templar grow into a teen and a monster hunter all at the same time. In the first book, he discovers and deals with the new monster hunter identity. In this book, he travels to the academy, along with his friends, Will and T-Rex. The trio of make-shift orphans have to try to find their place at their new schooling location, and Jack tries to cope with his romantic feelings for Eva, his battle buddy turned instructor. We find that Jack is much more compassionate than his other hunter companions when he saves the life of a well-hated wolf, thought to be a werewolf. He follows his intuition and goes out of his way to protect the wolf, despite the overwhelming negativity towards wolves at the academy. I liked the first book. But I really liked this book. The new characters at the academy are a great addition to the basic group from book one. Monster Academy set a more serious tone as Jack comes to realize that although he managed to live through his first run-in with the Big Bad Vampire Lord, he has much more to learn. I am already looking forward to reading the next book in the chronicles, whenever that happens to come out. What will happen to Jack and his buddies next? I love that the author began this series as an attempt to get his son excited about reading. How awesome to have your dad write books just for you!